Hi-Wire Brewing will be releasing three specialty beers this month highlighting their Sour & Wild Ale program, High Gravity 4-pack series, and a one-off can release for the Asheville City Soccer Club. Being released Saturday, April 14th at 12pm from their South Slope Sour & Wild Ale facility, customers will be to purchase Hi-Wire Brewing’s Oude Brett Saison (6.6% ABV). Blended down from a handful of red and white wine barrels, each one with it’s own unique character, to create this rustic saison with aromatic notes of barnyard hay and red hard candy. Moderate second use oak and earthy brett are accentuated by notes of baking spice and champagne in this tribute to the heritage of “old saisons”. This beer will see limited distribution the first week of May. The second release from Hi-Wire Brewing’s High Gravity 4-pack series is the Tropical Golden Strong Ale (11.3% ABV). This American golden ale uses fresh fruit to complement the tropical flavors and aromas present in Citra hops. Guava, papaya, and mango are added during secondary fermentation to create a dank, tropical fruit-forward profile. This high octane beer is deceptively drinkable, allowing big fruit flavors to mask the heat of this dank & sticky beer that does not taste anywhere near 11.3%. This beer will see full distribution in Hi-Wire’s entire footprint. For the second season in a row, Hi-Wire Brewing is the title sponsor for the Asheville City Soccer Club, who is part of The National Premier Soccer League, the second largest national soccer league in the US Soccer development pyramid, operating and competing in the 4th Division. 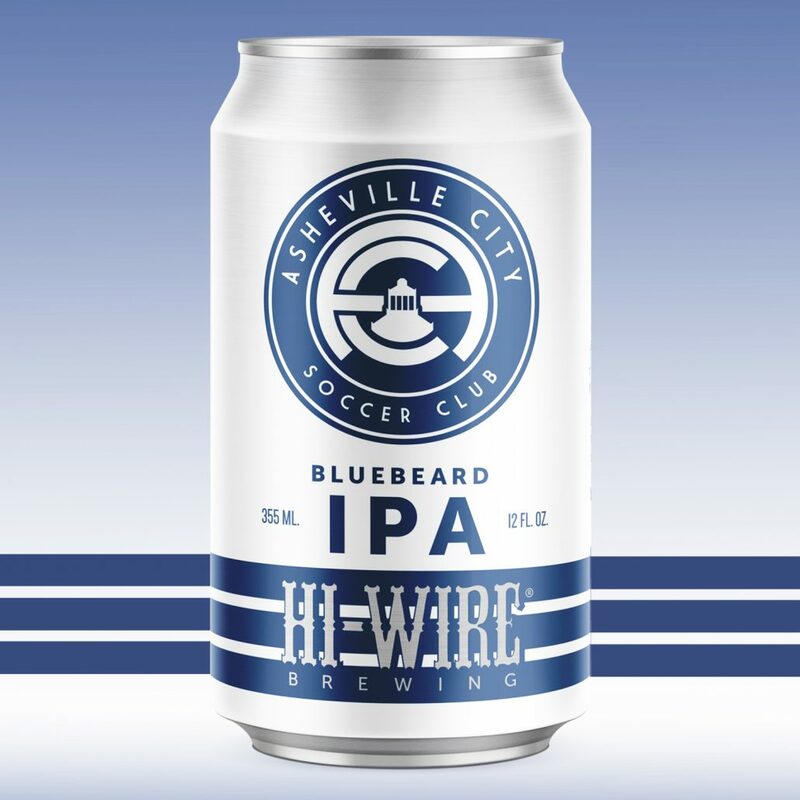 To celebrate their partnership, Hi-Wire Brewing created Bluebeard IPA, named in honor of Asheville City Soccer supporters. This bright and crushable IPA is perfect for a summer nights at Memorial Stadium, where the club hosts their home games. President of Asheville City Soccer Club, Ryan Kelly notes “As genuine fans of Hi-Wire’s work, it is an honor for us at the club to have our own beer to share with our supporters, whom we are privileged to name it after. We think the taste of Bluebeard IPA will become as synonymous with summer nights at Memorial Stadium as the sight of blue smoke and the sound of thousands of fans after an Asheville City goal. We are proud to wear Hi-Wire on the front of our jerseys, and it is truly a pleasure for us to take the partnership to another level and have our crest on a Hi-Wire can.” This beer will see very limited distribution in Western North Carolina the second week of April.